Cook the noodles in some salted water according to the instructions on the packet. Drain after reserving ½ cup water. In a pan, add garlic followed by shallots, red chilli flakes, carrots, capsicum, and sabji masala, in quick succession. Cook till the vegetables soften. Make a well in the center of the pan and add the beaten eggs. Allow it to cook well before mixing it with the other vegetables cooking in the pan. 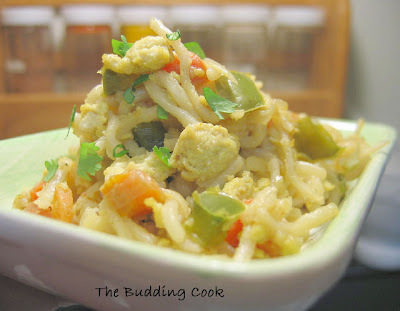 Add the drained noodles (use the reserved water if required) and mix everything together till the noodles are coated with the vegetable-egg mixture. Serve hot.